If you have remotely followed this series, you would know that I harbour more than a mere weak spot for all things originating from Tasmania, given the consistent quality that specifically tipples, and libations of that origin prove to uphold. Boutique-y Hartshorn Distillery with their sheep whey-based Gin and Vodka fits into the ranks of those premium micro distilleries – and when I say “micro” here it is more than appropriate given that Hartshorn is making only small, unfiltered batches using a two hundred litre glass column still. Aesthetically, Hartshorn is taking the DIY aesthetic to the next level: Each bottle’s artwork and label is created individually by hand and signed off by artisan head distiller Ryan after the foundation being spray-painted black. Talking of paying attention to detail and making each bottle truly unique. Given the premium quality one has grown accustomed to when it comes to Tasmanian emission it is not further wondrous that Hartshorn’s sheep whey emissions are award decorated. Artisanal in nature, the core business Hartshorn is associated with is Grandvewe Cheeses, which is the reason why quite a few of Hartshorn’s spirits are infused with the cheese by-product whey, the fermentation and distillation of which adds a subtle and delicious bouquet of sweet nuances and encapsulates the essence of Hartshorn: Character, flavour and intrigue. 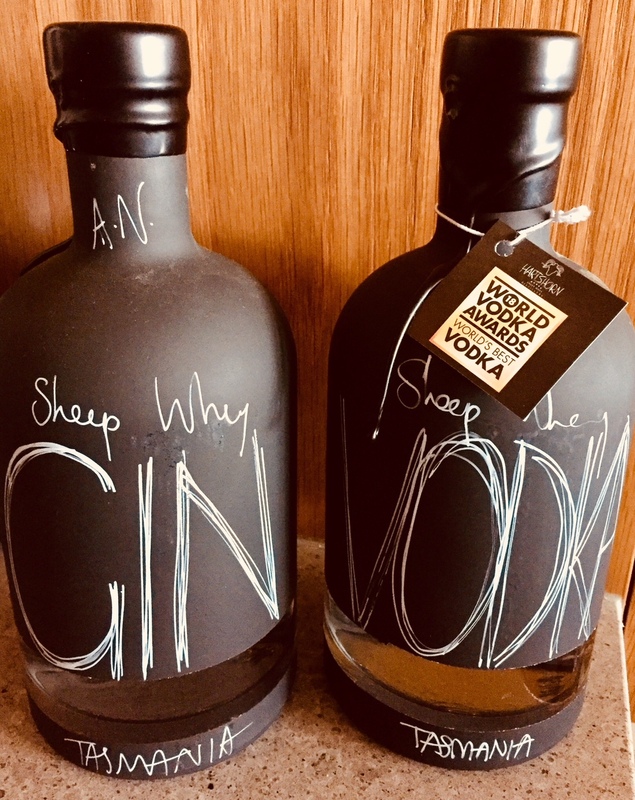 I cannot claim to be an avid vodka drinker, but Hartshorn's Sheep Whey Vodka is something else: It is pure and creamy yet there is texture due to it being unfiltered, it is flavourful yet not overwhelmingly so. Despite a high ABV of 50% it lends itself well to having it neat and sipping away, a feat that cannot really be claimed for a lot of other vodkas as the margin to hide behind is minimal as opposed to other liquors. The smooth finish is complemented by notes of spice and a crispness that still packs a tad of heat. Not less spectacular is Hartshorn’s vapour infused sheep whey Gin. The vapour infusion adds a subtle bouquet as opposed to the steeped method that gins are usually produced with. Again, not being big on gin, I must admit that this one won me over as there is a delicate intensity that makes it not only aromatic but lends itself perfectly well for sipping it neat, a feat that is achieved with the utilization of six unique native Australian botanicals adding their part to it.